When your bustling office needs additional storage, a solid wood credenza is the perfect choice. 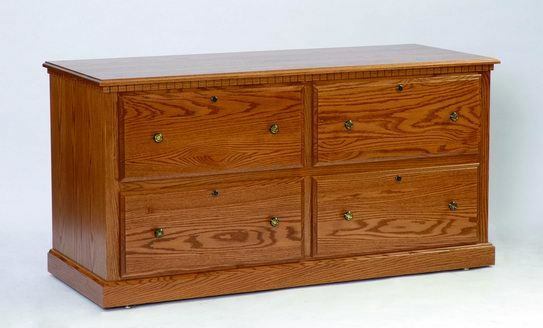 The Amish Heirwood File Credenza is handcrafted by the Amish and offers a versatile transitional style. Blending traditional elegance with modern shape makes this credenza a top choice. Four spacious drawers provide room to file and store documents while the surface is lined with exquisite dentil molding. Three solid wood shelves bring much needed room for books and manuals or to display awards or certifications. This Amish office furniture is 60" wide and comes in a variety of premium solid hardwood selections as well as rustic options. Completely customizable, you select the exact features you want for a desired look. Hi Valerie, The credenza is absolutely wonderful and I get terrific comments from everyone! Have a wonderful holiday season. I just received the file credenza. It is a magnificent piece of furniture. The workmanship is superb. My wife and I are extremely impressed with this item. The delivery (TLC, Garry and Billy) was excellent; what nice people and extremely accommodating. Garry kept me updated throughout. I will certainly want to deal with your company again. PLEASE, tell all the crafts-people how very happy we are with their work. Thank you for a very fine shopping experience!!! !